It's pretty hard to call a $10m home a good deal, but every other newer home in the Empire Pass area of Deer Valley is now well over $1000/sf in price. This one, in the "Red Cloud" neighborhood of ski in./out homes, was just reduced 10% in price to $9.9m and is now at $880/sf for a spectacular 11,200 sf of elegance. In the school of the popular new modern mountain contemporary style and design, it is a mountain statement and fabulous Deer Valley home. 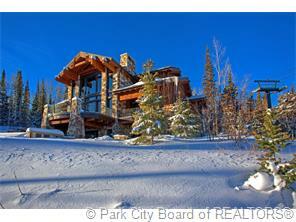 A good deal to be had for a spectacular mountain residence? Possibly! Contact me for details. Here is a new photo (taken 7/17) of the construction site for the new Park City/Canyons Gondola. Note the trees cleared for the lift to the top of Pinecone Ridge. On the left is the base of the Silver Lode high speed six pack. To the right is the foundation for the new Snow Hut restaurant. Will this begin to give Deer Valley some competition for best on mountain dining? We'll see! Can you imagine opening day this November, and the lineup to be first to ride on the first gondola to link Park City and Canyons! Dedicated hard riders and sliders will be camping out for 48 hours! I think ski patrol will have dibs however. How will this new experience of North Americas' second largest ski resort continue to drive our Real Estate Markets? Will there be continued demand and appreciation? We are already seeing the "Vail Effect" this summer, but when skiers and riders begin to talk about the actual experience of skiing the combined PC/Canyons, it will produce a previously unmatched media buzz, and influx of new visitors with interest. In the last 21 days: We've seen 2 homes in The Colony at The Canyons pended, at list prices of over 6.8m, and one closed sale of 7.2m. A closed sale in Deer Crest of 6.3m and another pended sale of 7.8m at the still under construction Stein Eriksen Residences. With two sales of older homes in one week over 3m in Park Meadows, and even a closed $3m sale in the remote area of "Victory Ranch", our market is attracting the uber dollars in droves. 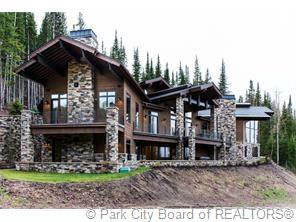 Those who can live anywhere, or recreate anywhere in the world, are increasingly choosing Park City/Deer Valley. Professionally helping and representing Park City area home Buyers to find the"best fit", the most suitable neighborhood(s), the best, smartest deal, and ground zero for appreciation. And helping present and negotiate a well written offer and terms for a smart buy and smooth transaction to ownership. If you know of anyone interested in Park City/Deer Valley Real Estate, call, text, or e me any time for further facts, opinions, and local insight!